It’s hot and dry. High time for a little immersion therapy. Water may not be exactly what you came to the desert to find—especially large bodies of it. But that doesn’t mean you wouldn’t stand on the brakes if such a mirage appeared in the blinding light of midsummer. Happily for travelers and residents alike, clean, clear, refreshingly large lakes can be found in every quadrant of our state. Lakes may, in fact, be New Mexico’s best-kept secret. Which one you choose depends largely on where you’re headed and what you’re looking for. Most lakes are “swim at your own risk”—lifeguards being as scarce as surfboards—but many shorelines are sandy coves or gentle slickrock drop-offs that let you satisfy the thirst to get wet without committing to 1,000 meters freestyle. Just remember to keep an eye on the kids and resist the temptation to hurtle into unknown waters. Unlike seashores or natural lakes, the bottoms of these reservoirs can hide all manner of geological surprises. Your first decision, come July, will be: north or south? Northern lakes can be numbingly cold until mid-summer, especially if the water source originates from Rocky Mountain snow melt. Southern lakes are your best bet if you’re a sun worshipper seeking a hot rock to lie on, then slipping into water that’s comfortably cool. Cochiti Lake, on Cochiti Pueblo between Albuquerque and Santa Fe, about 20 minutes west of I-25 on N.M. 16, features an artificial beach near a dam on the Río Grande, with a safe swimming area cordoned off from boaters and patrolled by rangers in summer. The water is comfortable by July 4, and the shaded picnic shelters with grills make the lake popular with families, especially on holiday weekends. Dogs are not allowed on the beach, but are permitted elsewhere on leash. Alcohol is prohibited. Abiquiú Lake is just an hour’s drive from Santa Fe on N.M. 96, just off U.S. 84, in the red sandstone country made famous by Georgia O’Keeffe. The lake sits at the base of Pedernal Peak, seen in many of her paintings, and is right near Ghost Ranch. This 4,000-acre reservoir of the Chama River has fingers running into high-walled canyons that are popular with wakeboarders and jetskiers. In summer, when the water warms up, families come to swim, camp, and barbecue. Navajo Lake, which straddles the Colorado border about 25 miles east of Bloomfield, is the state’s largest after Elephant Butte. Extending 35 miles, its long arms create 250 miles of shoreline amid the piñon- and cedar-covered rimrock. Houseboats cruise here among all manner of watercraft, and boat ramps dot the shorelines. Of the three developed areas on the New Mexico side, two have full-service marinas (one with boat rental). There are six official campground areas, plus many sandy beaches in the shadow of deep limestone cliffs along the tributaries—reachable only by rough 4WD ride or boat. El Vado Lake is connected to Heron by a scenic six-mile trail that crosses the Río Chama Gorge on an unforgettable suspension bridge. Though it buzzes with motorboats on weekends, El Vado offers quiet coves for swimming and fishing, and is set in spectacular hills at 7,000 feet. The picturesque town of Chama (30 to 40 minutes north) makes a great breakfast stop or day trip. Heron Lake, a 6,000-acre body of water in the forested hills south of Chama, is one of the few lakes that does not allow high-speed motorboating. Sailboats and canoes rule here, and there’s quiet, primitive camping along the shoreline. Some say the lake has the best lake fishing for trout and salmon in the state. Conchas Lake, 40 minutes from Tucumcari, offers plentiful secret spots for picnicking and camping in its many coves and inlets, accessible mostly by boat. At 25 miles in length, it’s paradise for boaters, with camping, picnicking, boat ramps, a marina, food service, and playgrounds. There’s even a golf course. Ute Lake is a playground for Tucumcari, and the third-most-popular lake in the state. It offers paddleboat rentals, five boat ramps, picnic sites, and endless camping along its 13-mile length. Like Conchas, Ute has become popular with windsurfers in spring, when New Mexico winds blow steady and brisk. 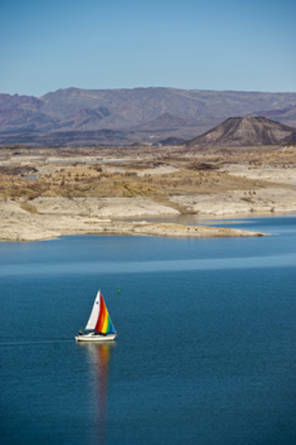 Elephant Butte is one of the first lakes to warm up in early summer, and is the top choice of sun worshippers later, when the northern lakes are dodging monsoon rains and a patchwork of clouds. As big as its name, at 40 miles long and 36,000 acres, it’s hard to miss New Mexico’s largest body of water, and the only spot that can really be said to have a beach. For locals, this has long been the summer boating and chill-out spot.